Now I'll ask the obvious question. Who is this for? And the obvious answer? Fans of Donald Duck and Darth Maul. Okay, that's your ideal audience, but it's pretty niche, right? Ridiculously so. It's more likely that this is a novelty item aimed at either rabid Disney collectors (of which there are many) or rabid Star Wars collectors (of which there are many) who will put pretty much add anything to their collection if it's something they don't have. But I can't help looking at this unlikely monstrosity and feeling that it's going to dissatisfy fans of Darth Maul, and alienate fans of Donald Duck. Once again, the forced pop culture mash-up scoops up some bucks but effectively pleases no one. I'm a Star Wars fan, and I like Donald Duck, as in I "respect" Donald Duck because he's an ill-tempered sailor who doesn't wear pants. But do I need a Donald Duck plush? No. And believe me, I've bought some pretty odd stuff. And trust me, regardless of whether you lean towards Lucas or Disney, if you buy this thing, you're going to be embarrassingly trying to explain just what the hell it is to everybody who comes to your house. "So... you know who Donald Duck is, right? Okay... well... Have you ever seen The Phantom Menace? Right... Look, just try to go with me here... Sigh..."
they strangely made these for Transformers too. 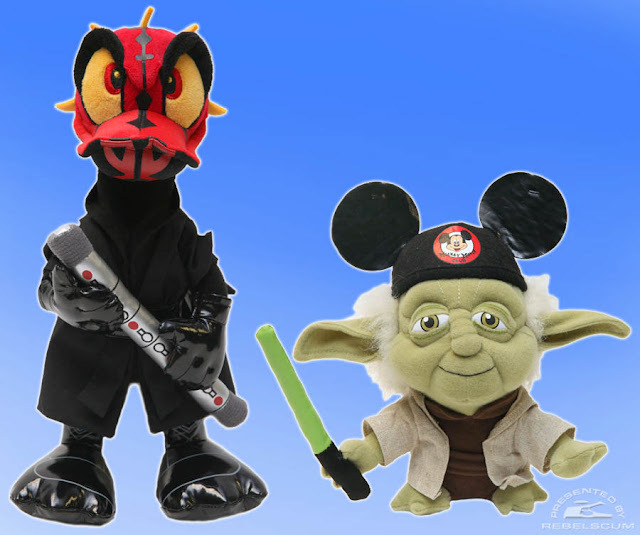 I will say that I am looking forward to the Star Wars Disney characters in Vinylmation form. The action figures are pretty awesome, too. Vote For O.M.F.G. Figures Series 2! Tuesday Bounty! Glorious Bounty Gets Stomped!